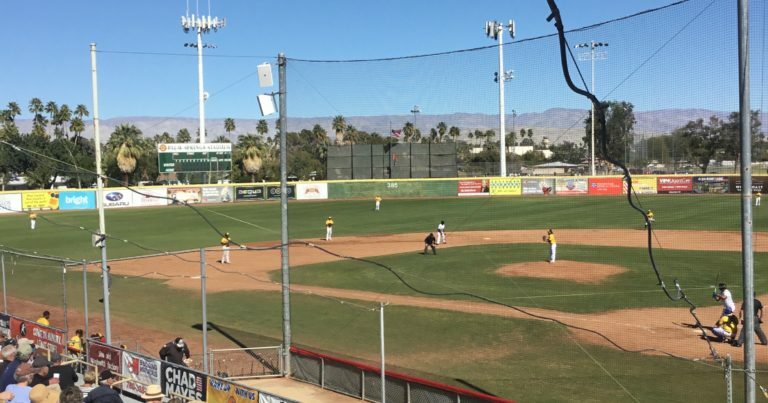 PALM SPRINGS, Calif. ~ The Canada A’s emerged as 7-3 victors over the New York Colonials in a back and forth battle in game one on the auxiliary field. The Colonials struck first when Ryan Myers launched a solo home run in the bottom of the second inning. The Canada A’s replied in the top of the third, however, when they strung together four hits and a walk to push across three runs and take a 3-1 lead, highlighted by Daniel Herrera’s single which drove in two runs. The Colonials refused to roll over, though, as Elijah Collins answered with a two RBI single of his own to tie the game at 3-3 in their half of the third inning. Tyler Pfeffer collected two RBI’s on a single for the A’s in the top of the fourth inning, which gave Canada a 5-3 lead that they would never relinquish. William Nix worked out of a couple of jams for the A’s over the course of 2 ⅓ scoreless innings of relief and Pfeffer hit a two-run home run in the sixth inning to make it a 7-3 final score in favor of the A’s. The Colonials fall to 3-6-1 and are 2.5 games back in the American Division, while the Canada A’s move to 7-3 and lead the Canadian Division by half of a game. The first game of the day at Palm Springs Stadium featured teams on opposite ends of the American Division standings as the Washington Blue Sox and the Oregon Lumberjacks played to a 4-4 tie. The Blue Sox struck first when Kazuaki Oishi hit an inside-the-park homerun scoring Kodai Kato in the second inning. The Lumberjacks strung together three hits in the bottom of the inning, scoring one off an RBI single from Reinaldo Gonzalez. The Blue Sox responded in the fourth inning extending their lead when Hayato Amomoto and Kodai Kato scored on hits from Kodai Sasaki and Minami Kurahata. The teams did not score again until the bottom of the seventh, when the Lumberjacks threatened once more by getting runners on base for Kevin Riley. He drove a two-run single into left to tie the game. Riley would advance to third on a base hit by Larry Alcime. He tried to score on the next batter but got gunned down at home from a laser throw from Tatsunori Negishi in right field to keep the game tied. Jordan Hill grounded out to end the game in a tie. The Toronto Rush downed the Palm Springs Power by a final score of 8-2 during game two action on the auxiliary field. The Rush got things rolling and made it a 2-0 game in the second inning when Grady Caldwell and Glenn Kubek had back-to-back singles then came around to score on consecutive fielder’s choice groundouts by Todd Weiss and Andris Rizquez. The Power cut the lead in half in the fourth inning courtesy of a double off the bat of Lamar Briggs which brought home Nicholas Michaels. The Rush’s Noah Lashley proceeded to rip a double into left field to score two runners and make it a 4-1 game in favor of Toronto. The Rush significantly broke open the game in the bottom of the fifth inning when Weiss added his second fielder’s choice RBI groundout of the day followed by a three run blast by Jon Argetsinger which made it 8-1. Won Jie Choi launched a solo homer for the Power in the sixth inning to wrap up the game’s scoring as the Rush now have a 6-3 record midway through the CWL campaign while the Power slipped to 4-6. Kyle Brown suffered a tough loss for the Power, but recorded three strikeouts in four innings pitched. Meanwhile, William Myers earned the win for the Rush, his third of the season, and only gave up one run on three hits while fanning three over the course of four innings. The second game at the stadium featured the top team in the American Division falling to the bottom team in the Canadian Division as the British Columbia Bombers beat the Palm Springs Chill 10-5. The Bombers struck first scoring nine runs in the first two innings sending 16 batters to the dish. Losing pitcher Keaton Slack lasted just over one inning of work giving up nine runs (four earned). Winning pitcher Garrett Brown started the game for the Bombers and only gave up two hits through the first four innings. He gave up the first run for the Chill in the fifth when Brian Pozos doubled and came in to score on a wild pitch later in the inning. Nico Garbella came in mid-way through the second inning and did not give up an earned run through four innings. The bottom of the seventh inning gave hope for the Chill as Garrett Brown only made it through one out in the inning before giving up five runs. Cory Lubinski came in and shut down the Chill, ending the game on a strikeout. Wednesday at the California Winter League will be $1 admission courtesy of Jack In The Box. Game one at the stadium features the New York Colonials @ the Washington Blue Sox at 10 AM, followed by the Manitoba North Stars @ the Toronto Rush at 12:30 PM.